This post was originally created after our first wedding expo, however we have since been going back and adding other little tips and tricks we’ve learned from subsequent expos. We hope this guide proves useful to anyone planning to exhibit at an exhibition and we’d love to hear about any other useful pointers you have in the comments section! After weeks and weeks of preparation for the MiliMarkets Love and Marriage Expo at the stunning Joondalup Resort, we find ourselves sat here - the event all done and dusted - wondering how our first wedding expo flew past so quickly! It was a really great experience to be amongst nearly 100 other businesses, big and small, who want to make Perth weddings just that little bit more magical. We spent time talking to lots of other vendors and it was so reassuring to learn that quite a few other people were doing this for the first time too. Also, a special mention for Cin's Cupcakes and Cakes who shared some of her incredible cupcakes with us towards the end of the day! One thing that several of us seemed to have in common was that there wasn't much readily available, detailed information for expo newbies; so with that being the case, we've decided to put together a description of all of the different considerations we made ahead of the expo and the things that we learnt throughout the day in the hope that this might help others! The truth is, we weren't actively seeking to do an expo but after a message from the wonderful organisers Lisa and Michelle of MiliMarkets we decided that we'd be stupid to turn down the opportunity. There were lots of different pitch sizes available and, given our lolly cart is a decent size, we opted for a 3m x 3m pitch with two open sides. We went for two open sides, mainly because we assumed this would mean we were on a corner and (in theory) would get greater visibility/traffic walking past. Unfortunately the layout of the room meant we weren't on the corner of a walkway but rather just the end of a section. Our biggest lesson here was to ask to see a floorplan and to see if it is possible to choose a pitch. Our guess is that even if you have to pay a small amount more in order to pick your pitch, the investment would definitely be worth it. In our case, our candy cart doesn't have lots of flashy lights, tv screens or thumping music to lure people in so we need to rely on eyeballs clocking our beautiful handmade lolly cart! That said, we did try a few extra things to catch the attention - more on which further down. We're lucky enough that one of the rooms in our house was (just) big enough to mark out a 3m x 3m square with masking tape in order to give us an idea of the amount of space we had to play with when planning out what our lolly cart display was actually going to be laid out like. 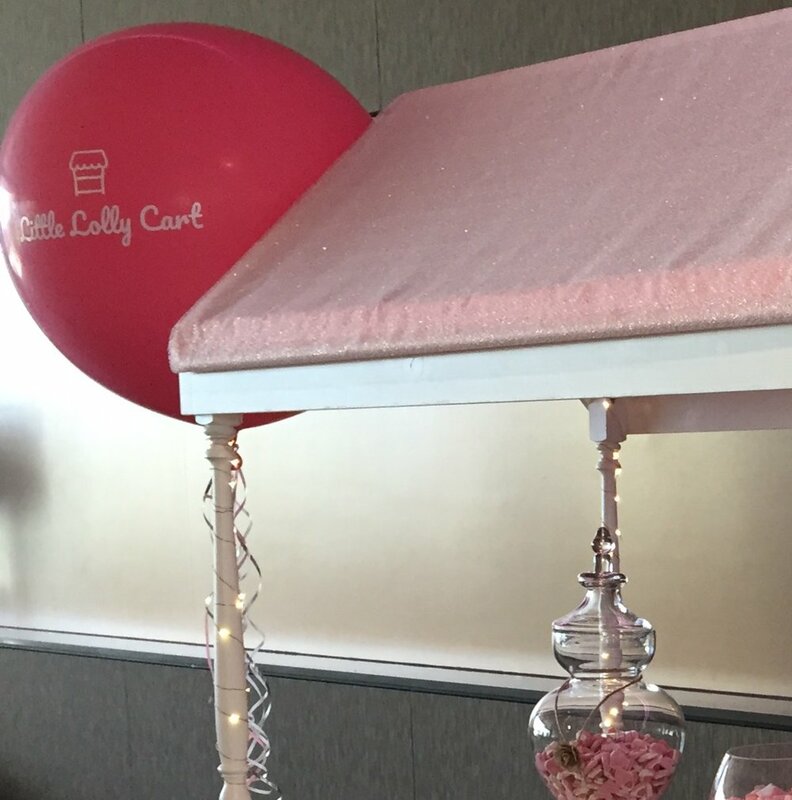 It was pretty obvious that the lolly cart itself had to take centre stage, however we also knew that in addition to lots of delicious candy and lollies, we'd want to be able to have a spot to put business cards, flyers and giveaways. If we'd have put all of those things onto our cart, we would have lost the overall impact that we'd been going for. After all, is it possible to make a plastic A5 flyer holder from Officeworks look vintage?! By having the layout marked out, we were able to begin figuring out where a small trestle table could go, but still leave plenty of space for the cart. We didn't realise it at the time, but the added bonus of knowing how we wanted to lay things out really paid dividends when it came to setting up at the venue. The organisers had done a great job securing early access to the venue the day before the event, but even so the loading area got pretty busy. By knowing exactly what we needed to put and where to put it, we were able to get in and out way quicker than if we had been sat there trying to decide how to lay it out. It felt a lot like when we set one of our lolly carts up at a venue, when it is usually a case of needing to be in and out within a small window of time, but still doing a professional job and making sure our customers are wowed with the results, whether that be a wedding, birthday party, baby shower, engagement party or other sort of event! This was kind of easy and probably one of the things we were most clear about in our minds from the start. We really love our baby-pink coloured canopy with a silver voile over the top and given the association of the colour with weddings, pink seemed to be a no-brainer choice to go with. We did however look critically at whether all of our glassware for the lollies truly had that "wow-factor" and concluded something was missing, so we went out and invested in two large, vintage, lidded vases that look simply stunning and also hold a heck of a lot of candy!!! Everything then built from these simple decisions, from the business cards (see further down) to the choice of lollies, to the free lolly handout bags by making the theming decision early on, it gave us a motif to build the display of the lolly cart around. We also decided that, given this was our first expo, the key outcome we wanted to achieve was to get our name out there and increase recognition of Little Lolly Cart as a reliable supplier of high quality bomboniere and lolly buffets/candy buffets in Perth. Quite a few of the vendors at the event were selling products or taking bookings and had clearly set that as an aim, so it definitely felt a little uncomfortable just kind of saying "Hi" and not putting the press on people to lock in a booking! That's not to criticise those vendors in any way of course, we just had a different reason for being there. Luckily, we were right next to a lovely business, Mini-U (http://www.mini-u.com.au) who had a similar aim of building awareness of their product so that definitely put us at ease a bit! By having a clear idea of what we wanted to achieve some of the decisions surrounding practicalities became clear. For example, we knew we'd need some ancillary pieces around the lolly cart that had to clearly show our business name and logo in an impactful way. When married with the decisions we'd already made around styling, we came up with the idea of putting our logo on really big pink balloons (which we bought from www.balloonworld.com.au in Booragoon, WA6145). Whilst the balloons were great, with hindsight we probably could have done something to make it clear that they aren't included when the cart is hired. Although our flyers were really clear, it was obvious that some people were a little disappointed that they were there for marketing rather than as part of the package. In a way, that probably means we really hit the styling on the nose, but at the same time you don't want to be misleading potential customers right from the moment they meet you! As well as getting our Little Lolly Cart logo as visible as possible, we thought long and hard about how we could get people to engage with us - or at least think about us again - after the expo had finished. It was obvious from events we'd been to before that having flyers was a no-brainer, but we wanted to make sure they didn't just end up in the recycling bin with 50 other flyers as soon as people got home. These were really easy to hand out to people and nobody minds taking a freebie, however we're hopeful that by needing to open the bag and pull the card and lolly out there will be a 'second exposure' to our lolly cart brand that may not have happened just with a flyer alone. Certainly our Instagram followers (@littlelollycart) have increased steadily over the past 36 hours. We did a lot of work researching how much getting t-shirts, business cards, balloons etc printed up with our logo would cost and although we had a budget for this kind of stuff, we were really unhappy at sinking money into one-off/low use costs. Meet our Silhouette Cameo 3, which is a vinyl cutting machine. We decided to invest in this machine so that we can print logos to go on t-shirts and balloons as well as stylising signage...in the future we'll also be able to use it to offer the option of personalising decorations for the lolly cart. Only time will tell whether this was a good move or not, but we're really happy that we now have the ability to brand generic things from the likes of K-Mart and Spotlight without needing to rely on third-party suppliers or vendors with the costs and lead times these bring. We also took the decision to go all out with our business cards seeing as we intended to use them in the giveaway bags. We wanted them to be attention grabbing or at least a little bit different to the run of the mill rectangular ones. We found all kinds of amazing designs, but settled on this one from www.zazzle.com. Of all the things we were most unhappy about, it was our flyers. Not because of anything the producer did - far from it in fact as Snap Applecross did a great job turning around the artwork and printing really quickly - but more so our design was done more to reflect our website colouring (which by the way has changed from a deep maroon to a lighter pink following feedback!) and in hindsight it was too dark and didn't match the rest of the setup we'd put together. The interesting challenge for us was that in addition to the lolly cart, which usually fills up the big car we usually transport it in, we also had to transport great big balloons, signage, a trestle table and lots of other ancillary pieces. We found that plastic crates were our saviour as we managed to pile these in to a second car and with the aid of a sack trolley they are easy to lug from a car park into the expo halls. Moving the lolly cart was easy as we have this down to a fine art now and the fact that they're designed to be collapsible means they come apart really easily and can fit through even the smallest spaces if needed. We'd taken the time to review the information supplied by MiLi Markets regarding setting up and layout of the loading bays, parking etc to make sure we knew where to park up, especially as it had the potential to get congested in the loading area with so many vendors. The bottom line is we planned for the worst (having to lug everything 100m from a car park in the rain) and hoped for the best (parking up right next to the loading dock). As it happened we got the best case scenario as we arrived nice and early the day before the event! This was something we'd learned from hiring out the lolly cart to events - always have bits and pieces on hand to make last minute fixes and adjustments! Every other vendor that we saw seemed to have all sorts of bits and pieces with them and we decided to stash it all away under our trestle table, kept hidden from view under the table cloth that we used to cover it...again, pretty much everyone was hiding all manner of crates, bags and boxes away under tables; they clearly cover all multitude of sins! If there is one thing you can guarantee it’s that everything will work fine up until the moment somebody wants to buy something from you, make a booking or put down a deposit using their card - at which point your technology will throw a tantrum and you’ll be left looking like an idiot. So have a think about how you would cope if one of your devices (such as an EFTPOS machine or laptop) doesn't work or can’t receive a signal on the day. What will you do if you forget to charge the iPad you use to take bookings on? We take a good old fashioned print out of our bookings calendar so that we know exactly what dates we have available in the event our online booking system decides not to work at the expo. We also take a small float of cash just so that if a customer does want to put down a cash deposit, we are able to offer them change; the same would apply if we were actually selling things. Finally, we always make sure we take a few pens and a good old-fashioned notepad because if all else fails we can always take the contact details for a customer and call/email them as soon as things are back up and running. Many months after the expo we were still going back using pictures for blog posts, but even more than that we found it to be a really great source of images for social media. We try really hard to avoid re-posting the same old pictures over and over again on our Instagram account (@littlelollycart) so having a big collection of pictures from both the build up and the actual expos has been a goldmine. With a product like ours, we vary rarely get the chance to take dozens of pictures when we’ve set up at an event because the event is usually about to get underway or it simply doesn’t feel professional to be stood like a member of the paparazzi snapping away while the client simply wants to get everything finished for the event to start! Every expo has points where the crowd dies down and you are left with some downtime, so why not take the time to get some unusual angles and perspectives on your product if it lends itself to it. Take some macro shots that will be interesting to your followers. Also, you may find professional photographers are also going around showcasing what they can do - the image above for example came from Rowena Murphy Photography who decided to go out and about during the expo to get interesting perspectives. Without a doubt, the best part was being able to see the reaction of the excited engaged couples and their families and talk to them to get real-time feedback on things they like as well as starting to build relationships with other vendors. It was particularly pleasing to hear that many felt our lolly cart was good value for money. As for the process of getting prepared, well at times it was stressful but also really rewarding to pull something new together. Usually we're a well oiled machine getting delicious lollies looking great for weddings, birthdays and other events but this time there was so much more to think about and so much more to go wrong.